Kay Guitars, in the 50's and 60's, enjoyed a particularly high level of visibility and a solid reputation among American and many British guitarists. 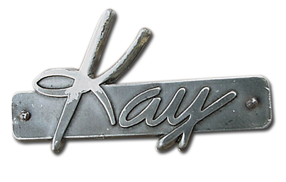 Many of those bands played Kay Guitars at the beginning of their careers. 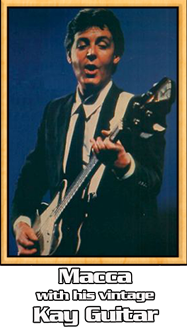 Even a few Superstars, seized the stage with vintage Kay instruments in-hand over the last several decades. Produced from late 1959 thru 1965, the Pro Series Thinline is a hollowbody guitar with a vintage "Bluezy" sound that looks like a slightly elongated Les Paul with a single pointed Florentine cutaway. 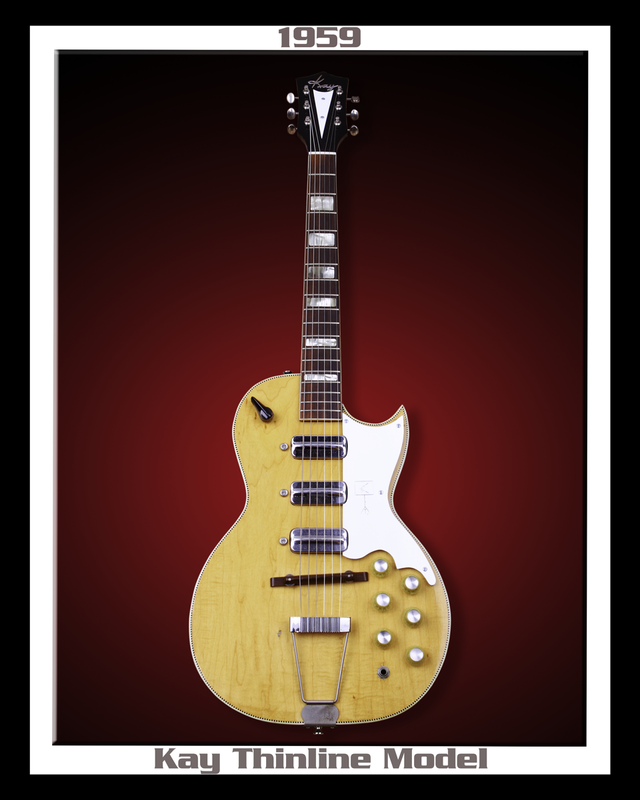 It has a laminated curly maple top and back that is hand rubbed and polished to a natural blonde finish. The sides are finished in black. The body is bound top and back with a striking black and white inlay on the top surface. 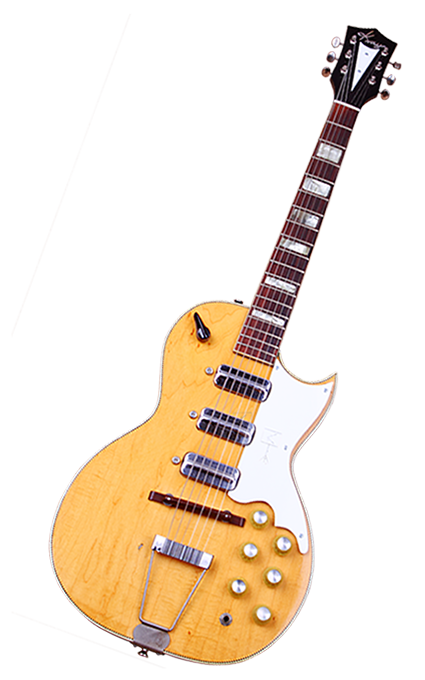 Three "high fidelity" pickups with ridged chrome covers are mounted to the top of the guitar and selected with a 3-position, chicken-beak, rotary switch. Each pickup has separate volume and tone knobs. The guitar has an ajustable bolt-on, steel reinforced, maple neck. The rosewood 24" Scale fretboard is fitted with pearlette block position markers, 18 nickel silver frets and topped with a bone nut. The headstock has the scripted Kay logo over a closed V chevron and closed back tuners with plastic Gibson style knobs. The adjustable rosewood bridge complements a beautiful chrome trapeze style tailpiece. 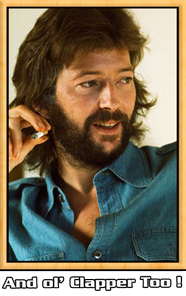 Famous examples of a Kay Guitars meeting Legendary Musicians are... Eric Clapton, who played both a Kay Jazz II and a late-model 1950 Pro-Series Thinline model in "The Roosters" (Clapton first band before joining the Legendary Yardbirds in '63). 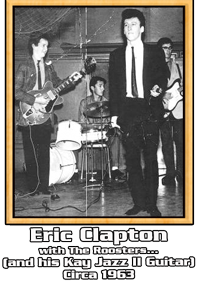 Jimmy Page also collected different Kay and Silvertone models, which he has used during different phases of his career with the Yardbirds and Led Zeppelin.